By the time the first Sydney Gazette was printed in 1803, official Government balls were well established. The early colonial era in Australia is recognised as one of the best documented histories of an emerging nation, this however, does not extend into the area of dance. Research of dances in the first half of the colonial period has been limited due to the extreme difficulty in finding pertinent records. It has been assumed that as dancing was not mentioned it did not exist, yet quite the opposite is true – dancing was a daily occurrence which people felt no need to record. Both convicts and the small elite immediately established traditional pastimes which had at their core the notion of pleasure and entertainment for its own sake, for enjoyment. The Rocks. Life in Early Sydney. Grace Karsken. Melbourne University Press, 1997. Mr Reichenberg, Music Master, of the 40th Regiment, respectfully informs the Ladies and Gentlemen of the Colony, that he has composed a first Set of Quadrilles for Australia, with proper figures adapted to it, for the Pianoforte, Flute or Violin; as also, for a full Band. The Same may be had in manuscript, from Mr Reichenberg, at the Military Barracks; or at Mr. Campbell’s, No. 93, George Street, by giving one Day’s Notice. Price 6s. The Sydney Gazette, 28th April. 1825. Modern historians such as Grace Karsken and James Boyce, have provided fascinating insights into the society of the lower orders which have completely overthrown old conceptions of life in the colony and confirmed that dance was a regular daily activity. 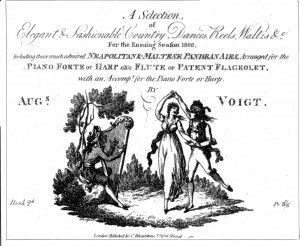 Just as the French danced through the Revolution to forget the austerity and terror, so the convicts sought diversion from the starkness of their situation with music and dance. The majority of convicts were not imprisoned and chained but rather enjoyed a much more unfettered life than generally imagined, they were free to gather, drink, gamble, fight, wed, celebrate, perform plays, make music, sing, and dance. As the settlement spread, isolation became a factor bringing an even greater significance to dances, sometimes providing the only opportunity for people to socialise and young ones to meet – celebrations would commonly last for three days. 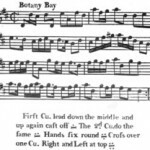 Forms of dance in the first thirty years of settlement included the English country dance, the minuet, reels, cotillions, hornpipes, jigs, and later, quadrilles and waltzes. These dances were the popular culture of the western world – The British Isles, Europe, America, Australia – and although performed differently from place to place and from event to event, the dances remained essentially the same. Although there is no doubt regarding the types of dances, the problem in Australia becomes the lack of detail regarding specific dances. Dance is by nature ephemeral, and although many newspapers and diaries recorded marvellous dances and balls featuring country dances and reels, and lasting until dawn, virtually no one mentions the title of a dance. Dance programmes did not exist and the honour of selecting dances fell to the top couple (especially the lady) who must describe and demonstrate the figures, steps and phrasing to the music. Some dances were popular or traditional varieties which everyone knew, some came from collections of the latest dances and others were devised on the spot. Dance titles often reflected current events of the time and could be named in honour of famous and influential people: Lord Sydney’s Fancy, Lord Howe’s Jig ; to commemorate special events: The Transit of Venus; in memory of places: Braes of Breadalbane. 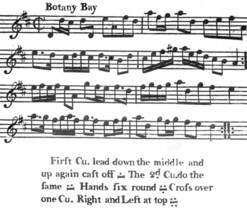 This is most helpful in the search for dances relevant to Australian history – the dance Botany Bay, published in 1788, was composed to mark the establishment of the new colony on the other side of the world. The scarcity of information regarding specific dances has necessitated a more thoughtful and academic approach with dances being selected using British sources of the period, where it can be demonstrated that there is a significant historical link to Australia. I have attempted to utilise every possible aspect of historical research available: not only the considerable resources in Australian libraries but also museums, art galleries and historic houses. This has revealed such treasures as Anna King’s ball gown , Elizabeth Macquarie’s cello , and Captain Piper’s domed ballroom in the shape of St Andrew’s cross , the earliest surviving quadrille music – all of which provide valuable insights into the dance culture of the early colony. In 1820, Sydney was a thriving community where people had been dancing for 32 years. 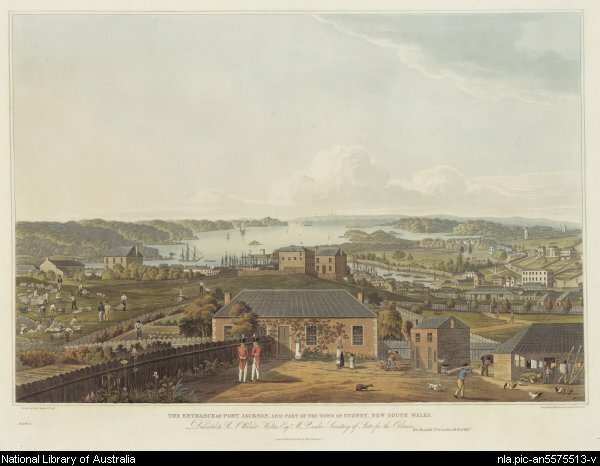 “The Entrance to Port Jackson and part of the Town of Sydney”, drawn by Major Taylor, 48th Regiment. Courtesy of the National Library of Australia. Jordan, Robert. Convict Theatres of Early Australia 1788-1840. Currency House, Sydney, 2002. Keller, Kate Van Winkle and Charles Cyril Hendrickson. George Washington. A Biography in Social Dance. Hendrickson Group, Connecticut, 1998. 8 Responses to What’s in a dance? Your scholarly papers are a delight to read. They are well researched, well footnoted, well written and artistically formatted. Thank you for bringing pleasure to the learning process. I think that these pages are very eloquently written. I was thrilled to discover your website via the RAHS Feb newsletter and thank you for producing it! We are in the process of developing a digital school curriculum unit Stage 2 and 3, Yrs 3/4/5 (Community and Remembrance) around the first convict settlers of Maitland, and your site will be a highly relevant and accessible resource. Identified activities in the unit familiarise students with music and poems of the period. I wondered if there was a particular dance you might suggest as being well suited for the students as well? How commendable that the Maitland City Council has such an enlightened approach to education. I would be delighted to assist with this project and I am aware that your area has some fascinating dance history. In 1882, J.Christison of Maitland published A Manual of Dancing and Etiquette, one of the first to be produced in Australia, and the Maitland Town Hall has the reputation of having a magnficent dance floor. In the very early days, I seem to recall a teacher of Irish dance in the area. Please send me more details about the first convict settlers and I’ll look into it further. Thank you Heather. That would be fantastic. Yes, you are quite right. We were fortunate to have a wonderful presentation by the great grandson of J Christison, Ray Christison at one of our Look Who’s Talking Local History events. J Christison was certainly a colourful character! A local colonial dance group attended and performed one of his dances which was an amazing experience. I’m loving reading your blog… thank you, Heather. Can you advise, please, what date your exhibit at Redcliffe Museum will be opening? The exhibition will run from 25 August until 18 November. I’ll post additional information as it comes to hand. Thanks for your interest.